Midnight, Texas is an American 60 minute scripted supernatural television series, which kicked off on July 24, 2017, on NBC and is broadcast every Friday at 21:00. The show is currently in its 2nd season. 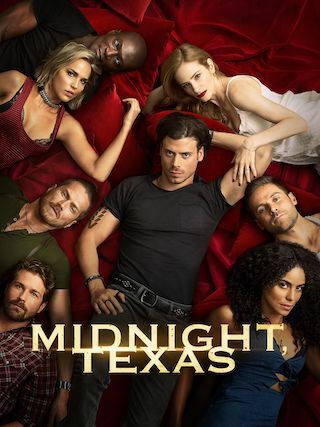 NBC opted not to pick up Midnight, Texas for Season 3. Midnight, Texas officially canceled on NBC. Sign up to track down your favorite TV shows. Welcome to a place where being normal is really quite strange, Midnight, Texas. From Niels Arden Oplev, the visionary director of "Mr. Robot", and based on the hit book series from author Charlaine Harris ("True Blood"), comes a journey into a remote Texas town where no one is who they seem. From vampires and witches to psychics and hit men, Midnight is a mysterious safe haven for those who are different. As the town members fight off outside pressures from rowdy biker gangs, ever-suspicious cops and their own dangerous pasts, they band together and form a strong and unlikely family.